​Congratulations to Robin Unander and the office at University of California - Santa Barbara for their incredible advocacy on behalf of students detained by the California Highway Patrol in Schmidt v. California Highway Patrol, Court of Appeal of State of California Second District. ​​California law requires certain traffic stops to be treated as detentions, NOT arrests, a practice that was being routinely ignored by the California Highway Patrol. Since 2012, Robin worked with local colleagues to win at the local level and successfully win again after the CHP appealed. "It all started with students I helped through the student legal service, and my research into the law on cases that the DA did not prosecute, and my conversation with this colleague about the problem. It is one of my finer moments professionally, and proof that we can make a huge difference from where we sit," Robin Unander, director at Associated Student Legal Resource Center at The Univ. of California Santa Barbara. ​Tom Betz, Director of Student Legal Services at The University of Illinois Champaign-Urbana, was selected for the Chancellor's Academic Professional Excellence (CAPE) Award to recognize his outstanding contributions to the campus community and beyond. Tom is a 1981 graduate of Wayne State University Law School, a member of the Illinois Bar, and formerly a member of the Michigan Bar. 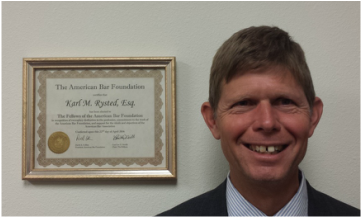 The Board of the American Bar Foundation has elected Karl Rysted, New Mexico State University’s Student Legal Aid attorney, as a fellow. Karl not only works with individual students on issues such as landlord/tenant questions, domestic relations, sexual assault, domestic violence, DWI, criminal, personal injury, debts and consumer law, he also serves as the adviser for the Associated Students of NMSU, which provides Student Legal Aid as a service to NMSU students. Karl received his law degree at the Oklahoma City University School of Law, and served as a Professor for two years before coming to NMSU. Karl is licensed in New Mexico and Oklahoma.